When you are doing something for the first time, it behooves you to do it right because, as most any good salesman will tell you, you never get a second chance to make a first impression. Well, Jaguar has entered the fray with its very first SUV, the 2017 Jaguar F-Pace, and the first impression is that the famed British marque most certainly did it right. Oh, sure, there are a couple of little nits I might pick at (and will get to later), but overall, this is hit right out of the box. 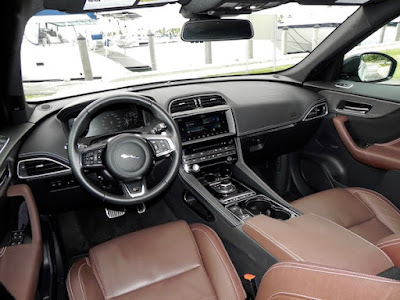 It looks great, performs like you would expect from a Jaguar, and easily fulfills the basic mission of an SUV, which is hauling people in comfort with all their stuff. 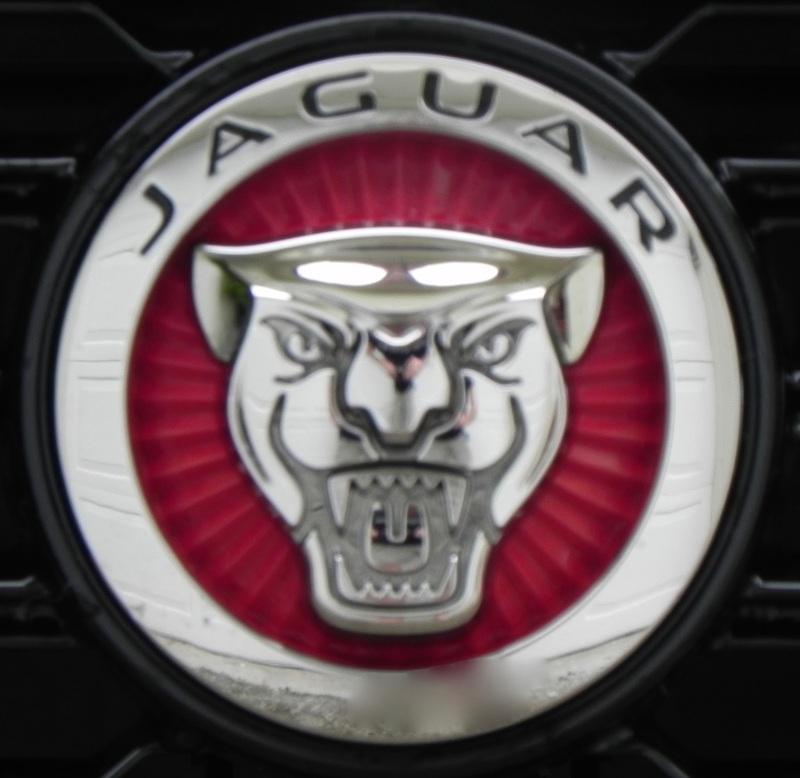 A good reason for all that could be that could be, according to a company news release, the F-Pace’s appearance was influenced by the highly success Jaguar F-Type coupe and convertible. Jaguar PR types even refer to the F-Pace as a “practical sports car,” and it should be noted the company clocked the F-Pace S model with its supercharged V6 engine (380 horsepower, 332 pound-feet of torque) at 5.1 seconds for getting from zero to 60 mph. Designer Ian Callum says that “every Jaguar car should draw your eye from 200 meters away,” and I would have to say the F-Pace does that. It certainly caught the eye of one of my neighbors, though I must confess I never asked how far away she was standing away when she gushed about it. 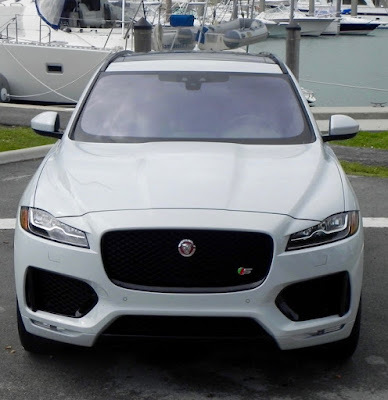 The F-Pace seats five passengers and is offered in five trim levels (base, Premium, Prestige, R-Sport and S) with three engine options (in addition to the aforementioned 380 hp V6, there is a a 340 hp supercharged V6 and a 4-cylinder diesel) all mated to an eight-speed automatic transmission with Jaguar’s rotary dial selector and paddle shifters, and all-wheel drive configuration. We’ll concentrate on the 2017 F-Pace S version here. 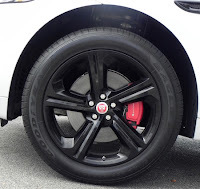 Standard equipment on the 2017 Jaguar F-Pace S includes adaptive driving dynamics which allows you to put the car in “dynamic” mode for enhanced performance (or you can go from Standard to Eco if you prefer), 20-inch wheels, LED headlights with auto high beam (it seemed to work more effectively than some past takes on this feature), 14-way adjustable sport front seats with leather surfaces and driver memory, keyless entry and push-button start, rear-view camera and blind-spot monitor, lane-keeping assist, and navigation. 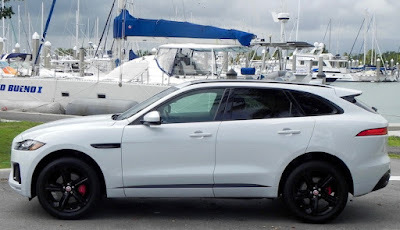 The 380 hp V6 version in the F-Pace S offers fuel mileage ratings of 18 miles-per-gallon city, 23 highway, and 20 combined, which falls on the low end of its class. But the performance makes up for it. Throttle response is instant, and its eagerness to take off is clearly evident when the transmission is set in Sport mode. The feeling is that of being aboard a thoroughbred race horse who wants to get the jump on his competitors so he can be first back to the barn for oats. The interior is refined but fairly simplistic in design. It’s also quite roomy, except for maybe the middle rider in the back who has to contend with the hump from the driveshaft. With an overall length of 186.3 inches, it offers front-seat riders what Jaguar calls “effective” legroom of 40.3 inches and those in the back 37.2 inches while still providing a roomy 33.5 cubic feet of storage space behind the second row. Fold the second-row seats and you get another 30 cubic feet. That’s a lot of storage space for those on the go. — The front doors have kind of a weird design with the upper half swooping toward the back. I actually banged my head on an open driver’s side door (yes, that is kind of klutzy), and it takes a while to get used to bending correctly to get in up front because of the sloping A pillar. —The InControl Touch system is not all that complicated to operate and response to voice commands was pretty good, but I never could figure out how to correctly adjust the various scales for the navigation map. The map seemed to jump around from very close up to a much broader overall look, and there were a couple of numbers at the upper left that defied explanation. Also, the nav system kept asking me to log in to my account, which, of course, I didn’t have. Fortunately, it was easy enough to clear that from the touchscreen. But neither of those nits would be considered deal breakers in my book. What I liked about the 2017 Jaguar F-Pace S: This is an SUV that really does handle more like a sport sedan. I prefer a firm ride over a cushy one, and the F-Pace came through there as well. But it is not overly stiff and seemed to handle ordinary street bumps quite well. 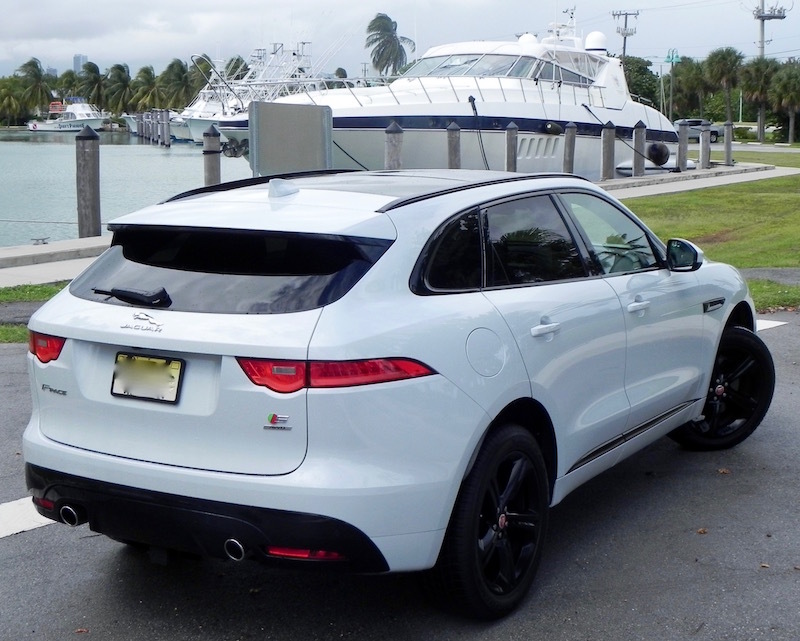 What I didn’t like about the 2017 Jaguar F-Pace S: Bumping my head on the driver’s side door when I simply leaned forward while standing next to it with the door open. You have to learn to duck your head just so to get in up front as well. 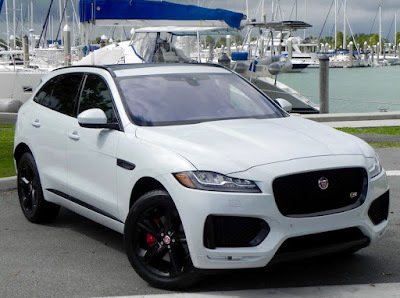 Would I buy the 2017 Jaguar F-Pace S: Yes. In its analysis of reviews, U.S. News & World Report rates the F-Pace No. 2 in its class behind only the new Porsche Macan, which is a bit more expensive. I also found infotainment and other technological functions in the F-Pace more user-friendly than is often the case in the luxury class. It's interesting how things coincide sometime. One recent morning I got an email linking to a story about how the Chevy Camaro had surpassed Ford’s Mustang in sales for September for the first time since October 2014. That afternoon what should show up in my driveway but a new Mustang coupe. Aha, I told myself, here is a chance to see if the 32 percent drop in sales for the Mustang for the month (compared to a 25 percent rise for the Camaro) was because of something wrong with the Mustang or was it something right for the Camaro. Well, I can’t say if it was the latter because it has been a while since I have driven a Camaro. I do remember that the last time I did, however, I was impressed with how much attention Chevy had given to the Camaro’s interior. It was nice. But I can say for sure that it isn’t because of Ford’s doing anything wrong with the Mustang. 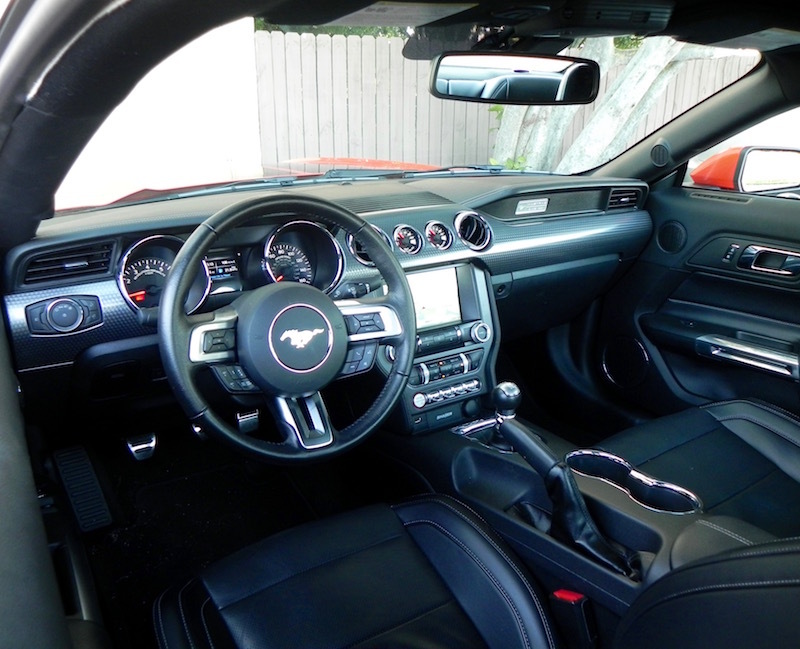 The company did right by the Mustang when it gave it a redesign for 2015. 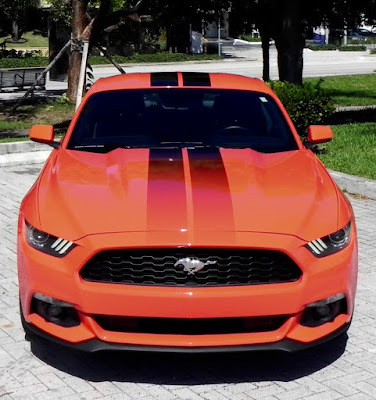 This is probably the best looking Mustang in several generations and is a much more refined vehicle than the ground-breaking Pony car that dates back to 1964. It’s much more comfortable than in the past, and the interior exudes a more genteel aura while retaining the traditional Muscle Car attitude. The refinements reflect a combination of strength and stylishness usually found only on performance vehicles at the entry level luxury segment. 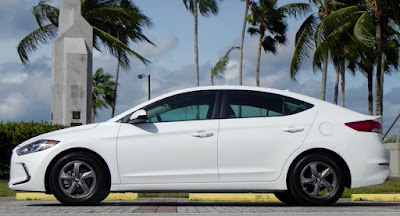 With little to be done as far as appearance and mechanics after the 2015 makeover, for 2016 Ford took aim at brushing up technological features such as the company’s new SYNC 3 infotainment system that simplifies operation of such features as audio and navigation via voice or an 8-inch touchscreen at the top of the center stack. It also added some appearance packages and added new colors and optional over-the-top racing stripes, a nod to Mustang’s racing DNA. The result is a Muscle Car that won’t wear you out while performing routine daily driving chores. The Mustangs is offered with three engine choices with the Ecoboost four-cylinder having joined the V6 and V8 last year. The thought of a four-banger under the hood of a Muscle Car may go against the grain for purists, but this is no fuel-sipping, punchless wimp under the hood. The 2.3-liter turbo-4 offers up 310 horsepower at 5500 rpm and 320 pound-feet of torque between 2500 and 4500, which is 10 more horses and 40 more pound-feet of torque than what the V6 offers. And it does do on 87-octane fuel. Mated with a six-speed manual transmission, the turbo-4 delivers plenty of kick in the performance department, and its throaty roar is pleasing to the ear as well. 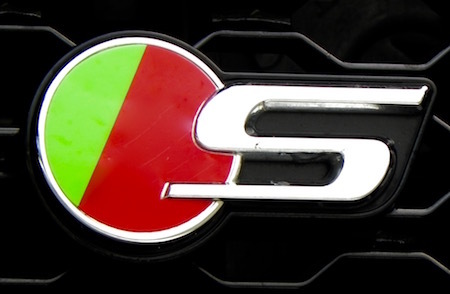 And, of course, it’s the most fuel-efficient of the engine choices. With the manual, which I highly recommend, EPA figures are 22 miles-per-gallon city, 31, highway and 25 combined with the turbo-4. Numbers are 21/32/25 with the six-speed automatic. The V6 is rated at 22 mpg combined with the automatic and 21 with the manual. The V8, with its 435 hp and 400 lb.-ft. of torque, checks in at 19 mpg combined with either transmission. Frankly, the overall winning package seems to be the turbo-4, that is unless you want to go all out and get the Shelby GT350 or the coming Shelby GT500 Mustang versions. Of course, you’re going to be shopping in the $50,000 to $60,000-plus range for those super cars. 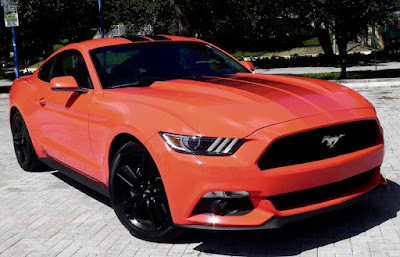 The turbo-4 coupe that served as my test vehicle, the 2.3L Coupe Premium, came with a base MSRP of only $29,300 with extras like adaptive cruise control, the Ecoboost performance package, voice-activated navigation system (plus the destination and delivery charge of $900), and a 12-speaker Shaker Pro Audio system running the total MSRP to $37,540. Standard equipment included HID projector headlamps, LED fog lamps and signature lighting, LED taillights with sequential turn signals, the 8-inch touchscreen for infotainment systems (also voice activated), dual zone climate control, leather-trimmed seats, tilt-and-telescoping steering wheel (the telescoping function was missing on the previous generation), rear-view camera, and Track Apps (for measuring performance). 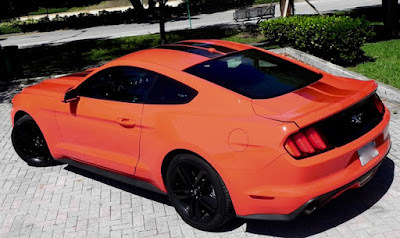 What I liked about the 2016 Ford Mustang Coupe Premium: Loved its overall appearance, especially with the optional 19-inch black-painted aluminum wheels. The Ecoboost turbo-4 engine offers a nice combination of throttle response, fuel economy, and engine sound. Oh, yeah. The mustang image that is projected on the ground when approaching the car at night is kind of neat as well. What I didn’t like about the 2016 Ford Mustang 2.3L Couple Premium: Want to experience your birth again? Just cram your way into the backseat and then extricate yourself by popping headfirst through the rear door jamb and the back of the front seat. You’ll pop out just like your entry on earth. Oh, yeah. That backseat is on the crowded side as well, but I’m not making any more analogies here. 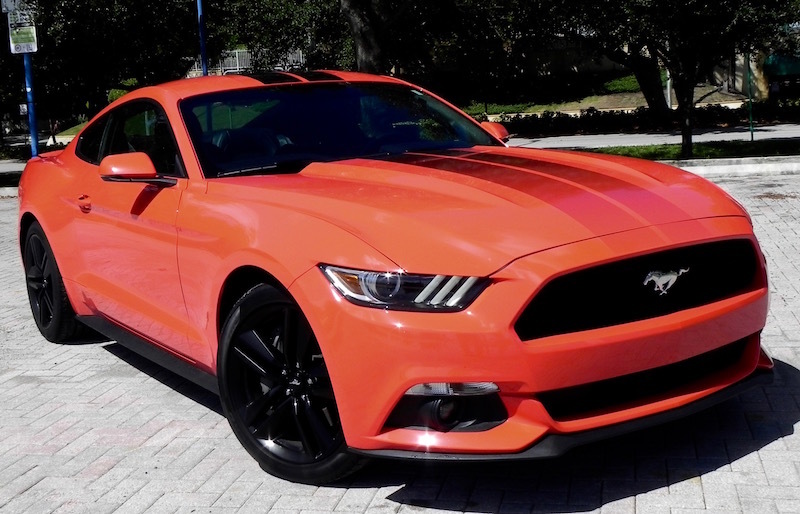 Would I buy the 2016 Ford Mustang 2.3L Coupe Premium? Yes. It’s fun to drive, and I don’t need the extra horsepower from the GT350. Plus it gets that performance using regular fuel. There was a time — and not all that long ago, by the way — that if you were shopping in the bargain section of the automotive market you had to be prepared to do without many of the creature comforts, and in some instances even safety measures, found on more upscale cars. Even if the those features were available in the price range of the model you were seeking, and they often weren’t, you had to pay extra. 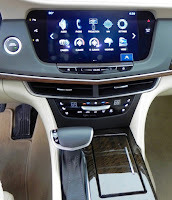 The “trickling down” goes back to the introduction of such features as power steering, antilock brakes (ABS), and power windows all first shown on luxury makes to more recent advances like rearview cameras, blindspot warning and lane-keeping assist systems, Bluetooth communications, and technological advances like Android Auto and Apple CarPlay. Many of them are standard on upper trim levels and even available as options on base models of the economy makes. 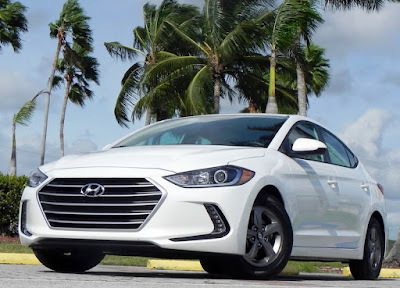 The base MSRP of $20,650, which falls between the $17,150 for the SE trim and the $22,350 for the top-of-the-line Limited, included as standard a rearview camera with dynamic guidelines (i.e., lines that follow input from the steering wheel to show you where you may be headed), cross-traffic detection, blind-spot detection, projector headlamps and LED daytime running lights, a 7-inch touchscreen for audio operation, Android Auto and Apple CarPlay connection, dual A/C, Bluetooth hands-free phone operation, steering wheel-mounted audio and cruise controls, leather-wrapped steering wheel and shift knob, heated front seats that are height-adjustable for driver and passenger, keyless ignition with push-button start, and a tire monitoring system that not only alerts you to a low tire but also shows the pressure for each of the four wheels so you don’t have to go hunting to find out which one needs some inflation. Oh. And it also has electronic stability and traction control and anti-lock brakes. Two optional tech packages that include navigation and HID headlights and adaptive cruise control also are available for a couple of extra thousand dollars depending on which one you choose, but the point here is that you don’t have to go there and still get many features that once were offered only vehicles falling in the luxury class. Don’t let those power numbers fool you. The Elantra Eco is no jack rabbit getting away from intersections, and it’s not the most-fun-to-drive in the segment. But it’s far from boring when set in “Sport” mode. That enlivens the performance over the other two settings, Eco and Normal, and doesn’t cost you that much in fuel mileage (though how much is hard to tell). 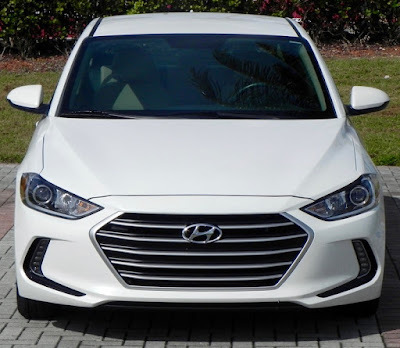 In addition to some nice touches and use of quality materials in the interior, not to mention more room for passengers because of the slightly extra overall length (179.9 inches to the 179.1 of the 2016 Elantra), Hyundai also has given the Elantra’s exterior a nice makeover. 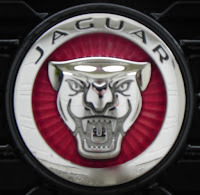 The front features the company’s new hexagonal grille flanked by catlike headlight components. Overall, this doesn’t look like what you might associate the typical economy car as looking like. That’s true both inside and outside. What I liked about the 2017 Hyundai Elantra Eco: The interior is nicely appointed and designed as well as roomy and quiet. Technological features are simple enough to operate. My test vehicle did not come with navigation, but nav systems in Hyundai’s other models have all been very easy to operate been for the non-technological inclined. At 14.5 cubic feet, the trunk is pretty good size for its class. 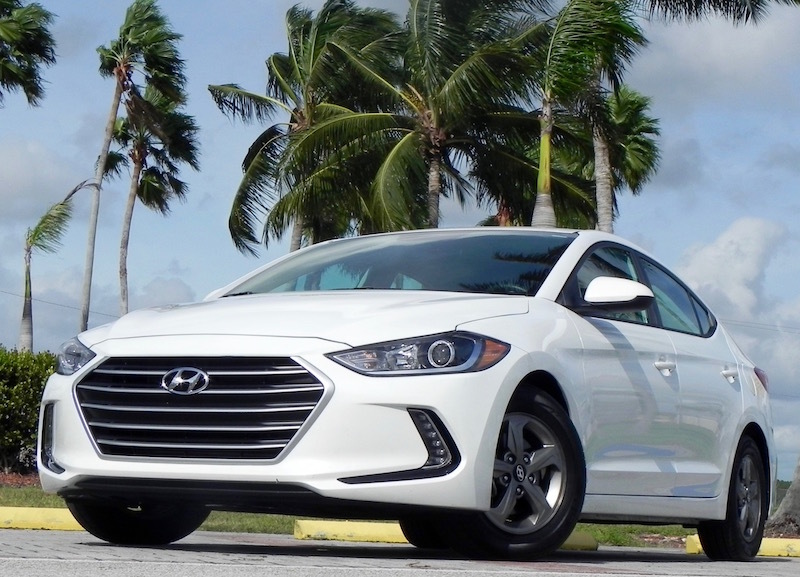 What I didn’t like about the 2017 Hyundai Elantra Eco: Throttle response can be inconsistent. A couple of times the turbo seemed to lag and then kicked in with a lurch, which can be disconcerting in high traffic. 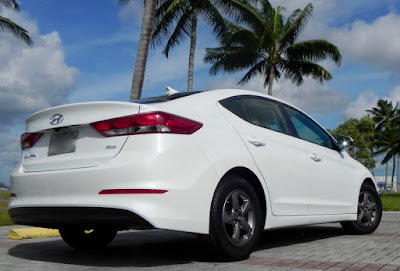 Would I buy the 2017 Hyundai Elantra Eco: Yes, though I might take a look at the Limited as well. If you really would like the company’s Sonata sedan but it stretches your budget too much, the Elantra Eco is a very nice alternative. 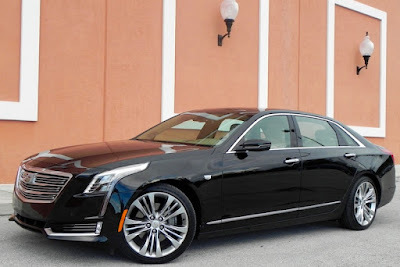 When you wade through all the SUVs, crossovers, and performance coupes and sedans — i.e., the “V” series — and get down to basics, the new 2016 CT6 really represents what Cadillac has been all about for well over a century. That is, a full-size luxury car that coddles customers with lots of room (especially in the backseat where up to over 40 inches of space for your legs is offered) and creature comforts like ventilated front seats power adjustable 20 ways, four-way climate control, and lots of cushy leather surfaces plus standard technological features like navigation, surround-vision camera system, lane departure warning and satellite radio on high-end trims. On the outside, though not a radical departure in design from its stablemates ATS and CTS, the CT6 has a sleeker profile than Cadillac’s other sedans with a new grille and lighting elements and, thanks to generous use of aluminum throughout the body, is lighter than its competitors, making for an agile performance more appropriate to a midsize car. Of course, publicists are known for hyperbole, but there’s no mistaking that while this may serve as Cadillac’s new flagship sedan, it doesn’t drive or handle like its predecessors, even when the gearshift is put in normal or “Touring” mode and especially with the 3.0-liter, twin-turbo V6 (404 horsepower, 400 pound-feet of torque) under the hood. The website zeroto60times.com clocked it at a flat 5.0 seconds, a little over a second quicker than the 2.0-liter turbo (265 hp, 295 lb.-ft.) that serves as the base engine. Put it in “Sport” mode and the throttle response is even quicker, though I did hear a complaint that the resulting stiffer suspension created a slightly “bumpier” ride. 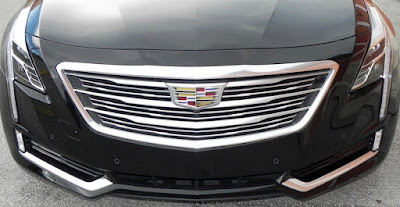 Frankly, even in “Touring” mode, the ride is not as soft as what was once found on high-end Cadillac models, but I did not find that necessarily a distraction. All three engines — also available is a 3.6-liter naturally aspirated V6 (335/284) — are mated with an eight-speed automatic transmission with manual gear selection via steering wheel-pounded paddle shifters. Fuel figures with the twin-turbo V6 are 18 miles-per-gallon city, 26 highway, which are decent numbers considering the power and performance you get. With the four-banger, they are 22/31and with the naturally aspirated V6 18/27. Premium fuel is recommended but not required. Rear-wheel drive is standard and all-wheel drive is available. 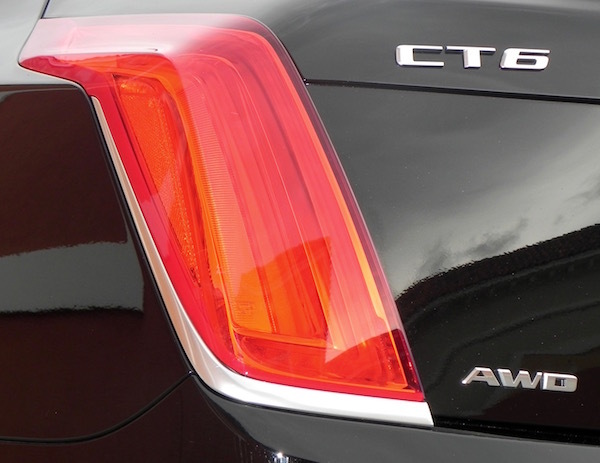 Pricing for the CT6 covers a wide expanse. The base model with the four-cylinder engine starts at $54,490, which makes it very competitive in the segment. But the Platinum edition with AWD and the turbo-V6 comes with an MSRP of $88,460, including the $995 destination and delivery charge. That’s getting up there, but that includes all the equipment listed above. What I liked about the 2016 Cadillac CT6: This is a full-size sedan that doesn’t handle like a full-size sedan. It’s much more nimble, and the four-wheel steering system (which Cadillac dubs Active Rear Steer) enhances accounts for some of that. I don’t know about the four-banger, but the twin-turbo V6 packs plenty of punch as well without gulping fuel at an alarming rate. 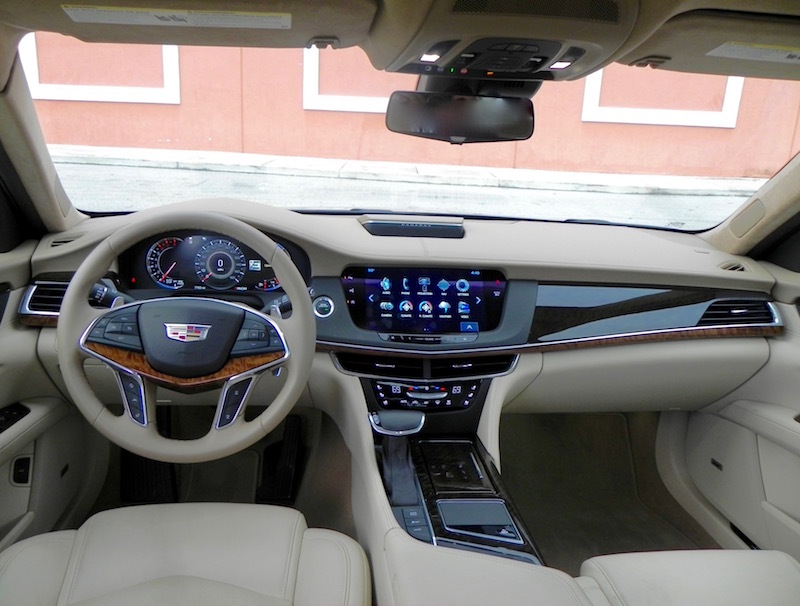 When it comes to amenities, the screen for the navigation system is a nice, large 10.2 inches, and the Bose sound system (standard on the Platinum model) is top-notch. You can adjust some functions by using a pad on the console similar to the way you do on a standard laptop computer. 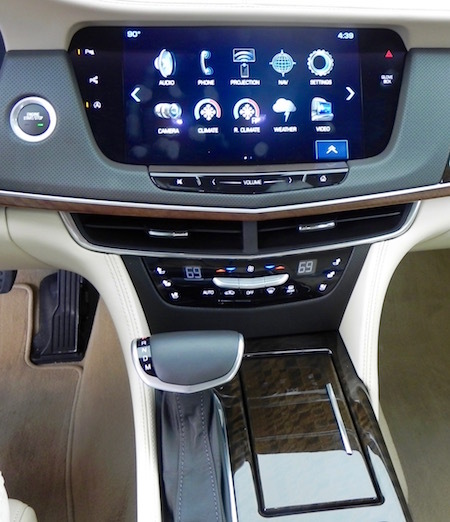 What I didn’t like about the 2016 Cadillac CT6: Cadillac has refined its “CUE” — it’s an acronym for Cadillac User Experience — system for all that technology and it is much less annoying to operate than the original. It no longer jumps to one function or another if your fingers happen to get near the screen like it did earlier. There are no knobs to clutter up the center stack, but this means some adjustments get tricky to make. The driver can adjust the audio volume, for example, with the buttons on the steering wheel, but the passenger has to run a finger on a horizontal bar to raise or lower it. It certainly is not a deal-breaker as I found on some of the systems of its competitors. Would I buy this car? Yes. Cadillac has a sedan that is truly competitive in its class. You may lean toward imports for the panache they bring, but Cadillac is getting back to vehicles that made the company the luxury leader when I was growing up. You may be pleasantly pleased by what you might find in the showroom.